For many Americans, the front yard is a prime piece of real estate, in fact, many newer neighborhoods in larger cities are doing away with front yards and decreasing the size of backyards in favor of increased indoor living space. The front yard can serve as an extension of one’s personality or status, and even if they serve as neither, chances are a few hundred dollars a year is spent just to keep it green. For Donald Sturman, his front yard, and back yard, is more than just an extension of his personality. While some people trim climbing vines, Donald is tending to 8 foot tall tomato plants (of 20 different varieties!). Where some people have a collection of rose bushes, Donald will have a small fruit orchard. 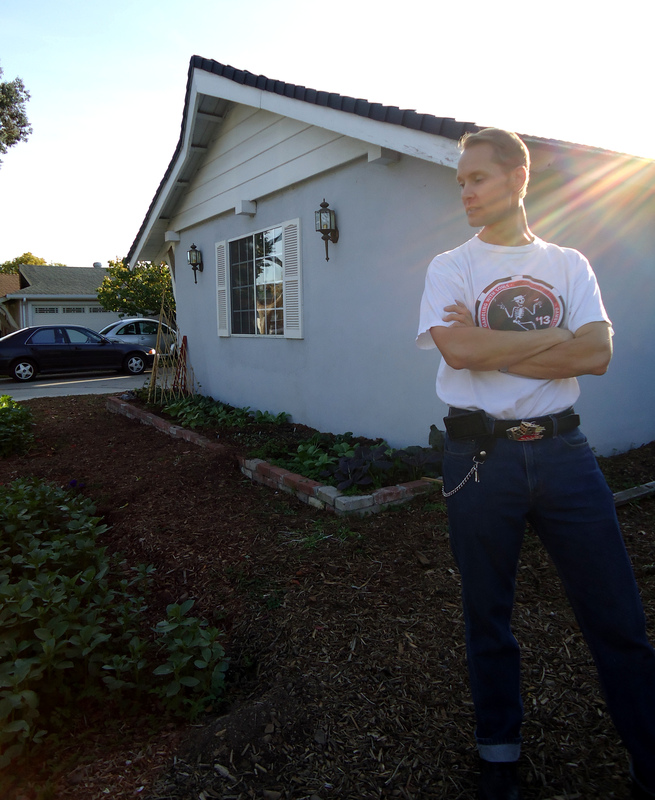 His yard is an extension of his lifestyle, one he hopes becomes a model in his neighborhood. By trade Donald is an auditor, but get him back home and he is Farmer Donald. Tucked in a nondescript San Jose neighborhood is Yummy Tummy Farms, where Farmer Donald has taken control of the local food system by creating his own. “There’s a bee I’ve never seen before, it’s a good sign when bees come around.” Farmer Donald says excitedly of a large bumblebee that hovers over four garden beds in his front yard. Farmer Donald grows about five types of leafy Asian greens, rainbow chard, carrots, sage, fruit trees (he’s planning for a cherry and cara cara navel tree), and in the summer blueberries and tomatoes–just in the front yard. 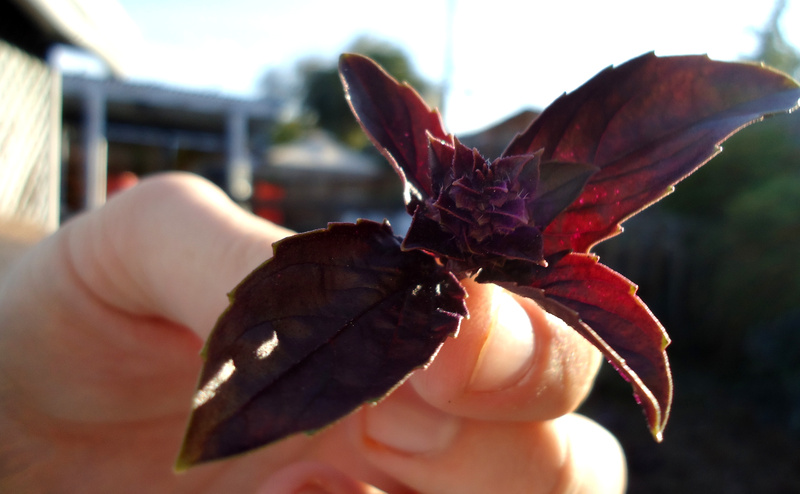 After ripping out the weeds in the backyard that measures about a quarter of an acre, Farmer Donald grows a couple of types of basil, a few varieties of kale, lavender, rosemary, three bee hives, and has multi-grafted fruit trees. Growing up in Monterey County, Farmer Donald was surrounded by farm fresh produce. After moving to San Jose where farmers were pushed further into the hills and fruit orchards gave way to growing businesses, Farmer Donald began to miss the quality of the food he grew up on. 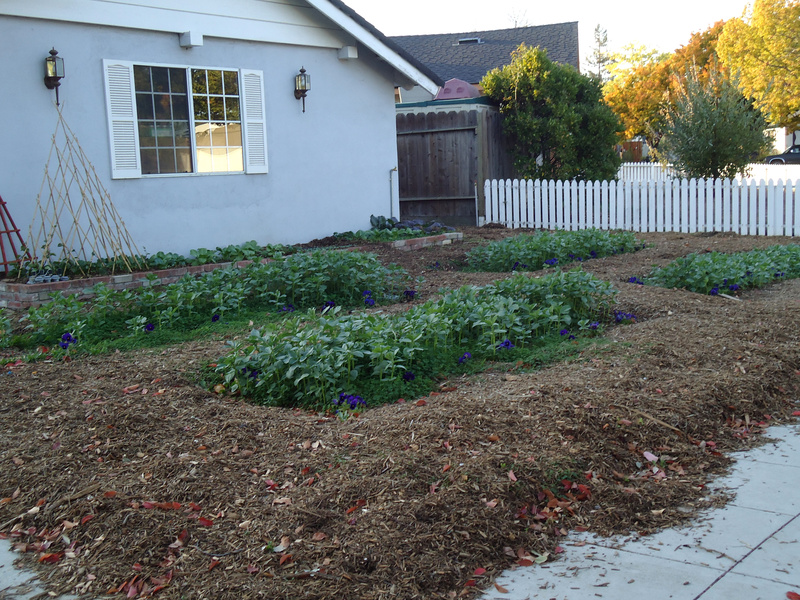 Combined with his concern of the rising rates of obesity and related diseases, he turned to the idea of suburban farming. He enrolled as a student at Love Apple Farms in Santa Cruz, CA, where he learned about biodynamic farming. Soon after he grew 120 heirloom tomato plants. Today, after two years of meticulous planning, designing, scheduling, and a little creativity, Yummy Tummy Farms is well on its way on becoming closed, self-nourishing system. Biodynamic farming is the practice of a type of organic farming, that emphasizes the relationships between soil, animals, plants, and farmer, whose goal is to create such relationships so that the farm as a whole becomes a self-sustaining system. Farmer Donald practices this method of farming by using green compost and fertilizer (egg shells), maintaining worm bins, drip irrigation, and seed saving. Not only does Yummy Tummy Farms produce organic, fresh vegetables for Farmer Donald’s family, the farm serves as a classroom. Using Craigslist, Farmer Donald began sharing his knowledge of biodynamic and suburban farming and gardening to apprentices from around the Bay Area. In return for getting their hands dirty, apprentices share the fruits of the farm’s bounty in addition to the tools to begin their own suburban farms. As an accountant, Farmer Donald analyzes financial risk and manages multiple accounts. True to his trade, he practices similar principles, which, when applied biodynamic farming, keeps the farm efficient and running smoothly. While he is growing plants that can handle the winter weather, in a small room accessible through the garage, Farmer Donald has an impressive mini nursery for small seedlings. 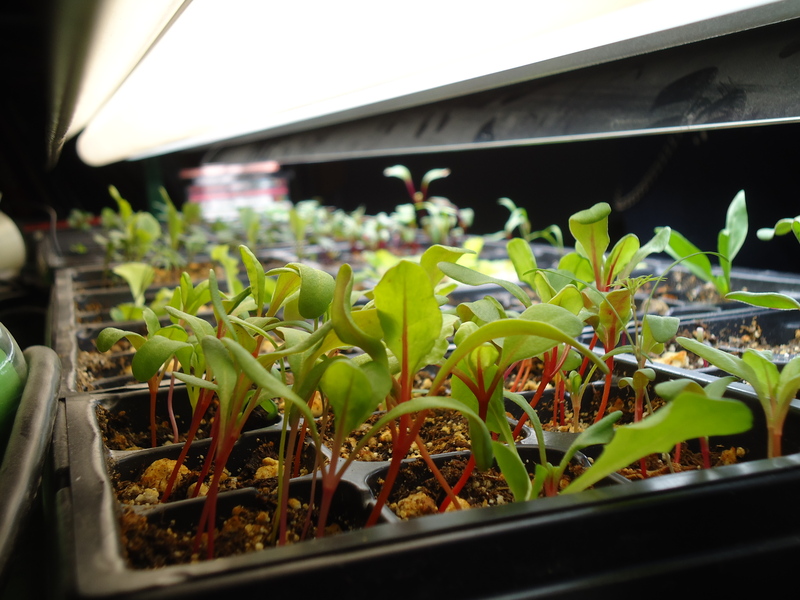 These seedlings, totaling almost 150, will be re-potted or transplanted to grow into beets, kale, cauliflower, pumpkins, and other produce. Farmer Donald isn’t stopping there. He is constantly educating himself and others, and advocates for healthy food and farm policies to protect small and mid-sized farms. In fact, he hopes that his small farm can one day provide as a CSA to his local community. And even sooner, he hopes to share his love of cooking with his neighbors. He already shares honey, preserves, and pickled goods at SJ Made, a vendor fair of local artisans. This entry was posted in Food Warrior Interns, On the Farm and tagged biodynamic, biodynamic farming, charlotte simpliciano, farmer donald, organic farming, Real Time Farms, suburban farming, yummy tummy farms. Bookmark the permalink. Nice article. It’s really cool that you’re covering this stuff in the SF Bay Area (and even in suburban San Jose). I work with a non-profit called California FarmLink and I work from home in Mountain View. I would love to tell you more about what we do in case you come across farmers that could benefit from our services. Can you drop me a line when you get a chance?